Despite nearly making the Super Bowl last season, the New Orleans Saints still have a few holes on their roster that need to be addressed, specifically at tight end, defensive tackle, wide receiver, an offensive lineman that can play both the guard and tackle positions, and at safety. The Saints are expected to target a wide variety of players in free agency next month, but the reality is that they won’t have enough money to sign every player that they want (or need). This means that they’ll likely have no other option but to address those positions in the upcoming 2019 NFL Draft in Nashville, Tennessee from April 25th through the 27th. Unfortunately, however, because of the trade that they made last year with the Green Bay Packers to move up and select rookie defensive end Marcus Davenport with the 14th overall selection in the 2018 NFL Draft, the Saints do not have a pick in the 1st Round this year. Additionally, the trades that they made with the New York Jets to acquire backup QB Teddy Bridgewater (3rd Round pick) and the New York Giants for CB Eli Apple (4th Round pick) come into play this season. Because of these moves, New Orleans will only have a 2nd Round pick and a 5th Round selection to go along with two 6th Round picks and two 7th Round picks, for a total of only six total picks in this year’s draft. So unless the Saints’ front office does their normal wheeling and dealing to acquire some additional picks, they’ll have to make each decision with the idea of choosing the very best player available who can help the team not only for the 2019 Season, but into the future as well. With that in mind, this morning Big Easy Magazine proudly debuts our first-ever Saints Mock Draft which – for the sole purpose of future articles on this topic leading up to the Draft in late April – we will refer to as “1.0”. One could make a compelling argument that the Saints should address their tight end position with this pick, and it wouldn’t be wrong. However, for this morning’s Mock Draft, we will assume that the Saints have signed a tight end in next month’s upcoming Free Agency period (someone like Steelers back-up tight end Jesse James); and in this scenario are fortunate enough to have Samuel still sitting on the board when they make this pick. Current #2 WR Ted Ginn Jr. will be turning age 34 this year, and last year’s 3rd Round pick Tre’Quan Smith appeared to struggle at times last season with the “growing pains” that generally come with the development of NFL rookies at the wide receiver position. Additionally, there are no guarantees that either veteran WR’s Dez Bryant or Cameron Meredith will be able to bounce back from their respective injuries; and UDFA Keith Kirkwood has potential but isn’t precisely feared by opposing defenses. 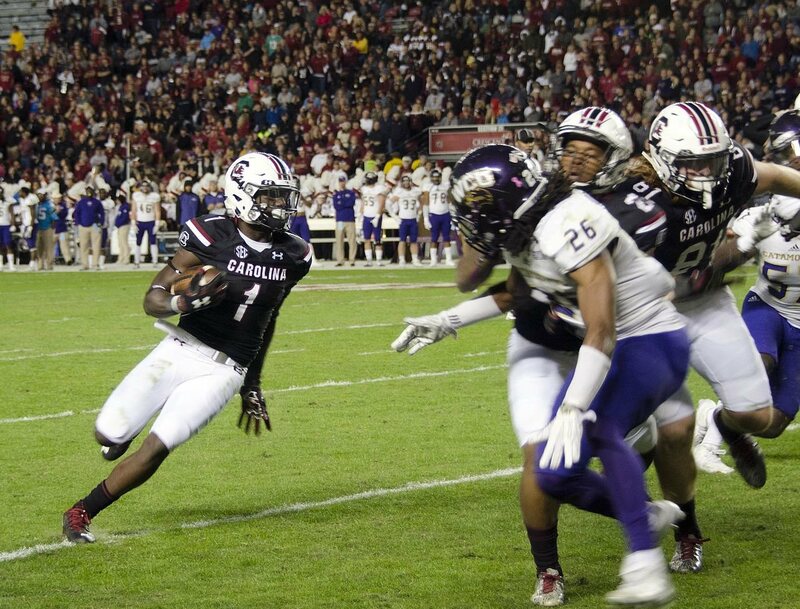 What the Saints genuinely need is a complementary receiver who can become a serious threat on the outside and create mismatch problems for defenses on the side opposite of Saints#1 WR Michael Thomas; perhaps no one player could potentially fill that role for the Black and Gold better than University of South Carolina WR Tyshun “Deebo” Samuel. 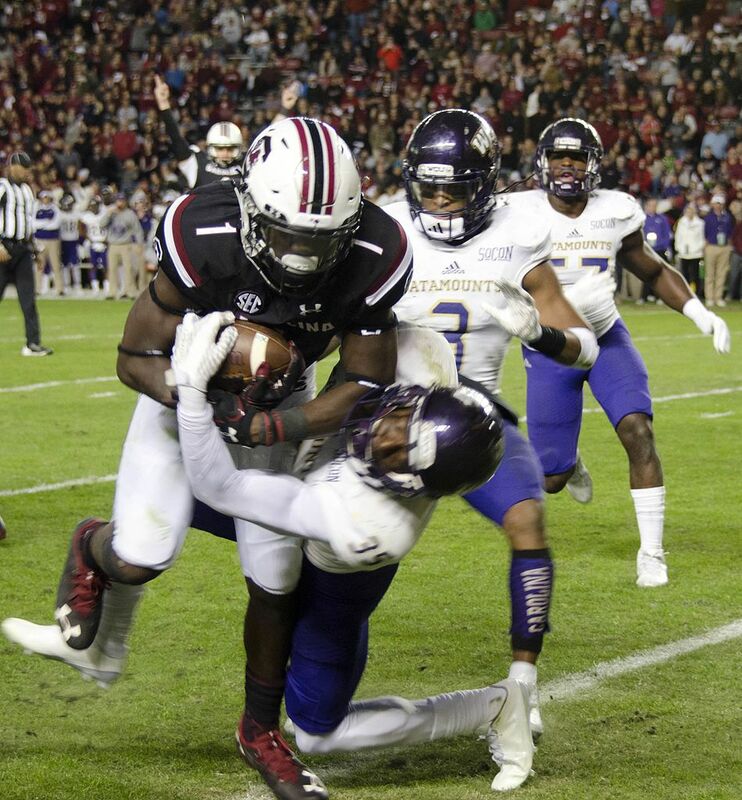 In the 2018 season, Samuel had 62 receptions for 882 yards and 11 receiving touchdowns; USA TODAY Draft Wire analyst Gavino Borquez notes that the former 1st team All-American possesses such explosive quickness that defenders who have the responsibility of covering the 5-foot-11, 200-pound Samuel, at times just simply aren’t able to keep up with him. Borquez adds that Samuel is the type of player that any NFL coordinator would want to scheme plays for, to get the ball into his hands as often as possible. Late last month at the annual Senior Bowl college all-star game in Mobile, Alabama, Saints team brass (head coach Sean Payton, GM Mickey Loomis, and Director of College Scouting Jeff Ireland) were all watching on in attendance as Samuel dazzled NFL scouts with a jaw-dropping display of his various capabilities. There’s always the chance, of course, that another team could take Samuel before the Saints make their pick at #62 overall, but if he does happen to be there still? You can certainly bet that Saints brass won’t hesitate to make that selection. Not only would Samuel contribute immediately next season as a rookie, but he very likely would become an essential part of the franchise’s plans for the future as well. With starter Sheldon Rankins expected to miss the first part of next season as he recovers from surgery (Achilles tendon) and a possible suspension of back-up David Onyemata (possession of marijuana) still a possibility, New Orleans essentially will now be forced to address the defensive tackle position in either Free Agency or the Draft. For the sake of this morning’s article, we’ll have them address the DT position with the selection of Arizona State University 3-Technique DT Renell Wren — who might be the most underrated interior defensive linemen in this year’s Draft Class. Wren also had an impressive showing at last month’s Senior Bowl; reports are that he was so dominant during practice that he eventually commanded a double team. The 6-foot-4, 315-pound Wren started as a defensive end initially; much like Rankins and Onyemata, he is capable of playing anywhere along the D-Line. Last year as a redshirt senior, Wren tallied 43 tackles, 4.5 TFL’s (tackles for loss), and a sack this past season. For his whole career, Wren only had three sacks, but that was because he wasn’t a full-time starter until last season under head coach Herm Edwards. According to Bleacher Report NFL Draft analyst/writer Brent Sobeski, Wren has the size teams covet, but his quickness to get into the backfield is his greatest trait. 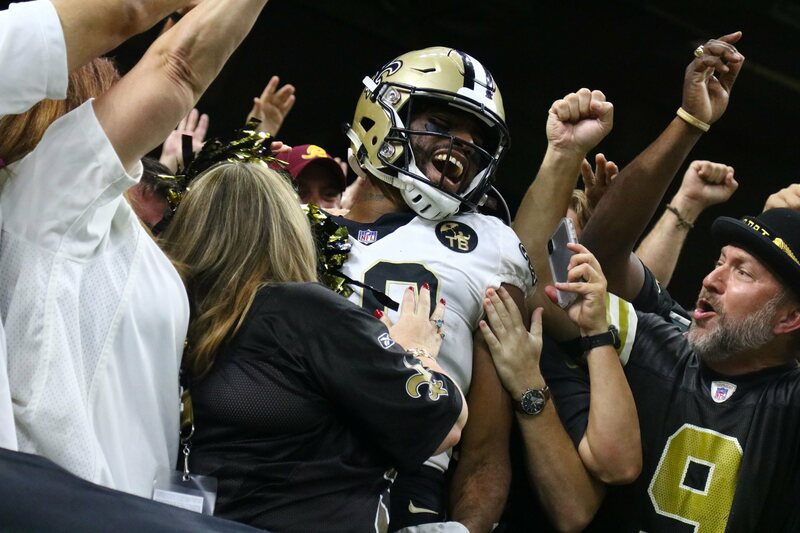 With the genuine possibility of losing both Rankins and Onyemata to start the 2019 NFL Season, it’s a trait that the Saints might decide to use to for themselves if he’s still available. There’s a very distinct possibility that the Saints could find themselves without a solid #2 QB behind Drew Brees if Teddy Bridgewater leaves in Free Agency. Should that happen, that would leave the team with 3rd string QB Taysom Hill as the primary back-up behind the 40-year old Brees. While Hill is more than capable of guiding the Saints offense if something were to happen to Brees, he isn’t considered a long-term solution at the position once Brees leaves for good. Which is precisely the reason why Saints head coach Sean Payton might be tempted to consider one of the more underrated players in what is a fragile Draft Class: Boise State University QB Brett Rypien, the nephew of former Washington Redskins Super Bowl-winning QB Mark Rypien. Last year, the 6-foot-2, 200-pounder threw for 3,705 yards and had 30 TD passes to only seven interceptions; and he broke the Mountain West Conference all-time passing yardage record (13,578). In his four-year collegiate career, Rypien finished with 90 touchdown passes and 29 interceptions. Bleacher Report draft analyst / writer Maurice Moton says that Rypien doesn’t make many mistakes in the pocket and can throw an accurate deep ball, but will have to overcome critics who question his lack of size. Nevertheless, Moton additionally notes that Rypien’s leadership and maturity make up for his physical shortcomings; and assuming that he’s still available, the Saints could afford to take a gamble at this point of the Draft (Day 3) and perhaps get lucky enough to find their “QB of the future” finally. Veteran Kurt Coleman is likely to be cut and released in a salary-cap related move, and 2nd-year free safety Marcus Williams appears to have taken a step back in his 2nd season. As such, many observers feel that the Saints could benefit from an upgrade at the safety position with a player with the versatility to play either as the free safety in pass coverage or the strong safety spot in run support. Marshall University safety Malik Gant is such a player — and just like everyone else in this morning’s Mock Draft — is a player that currently is very underrated or being extremely undervalued. The 22-year old Gant left Marshall a year early and finished his junior season with 95 combined tackles (45 solo) 9 TFL’s, one sack, two interceptions and eight PBU’s (pass deflections). According to Draft Network Lead Analyst Jon Ledyard, Gant might be a bit limited at the pro level athletically against smaller, shiftier slot WR’s, but he should match up well against tight ends and bigger slot receivers. Gant is a very sound tackler and will often rely on his aggressive playing style to make plays. Given that the Saints secondary appeared to have some difficulty with their share of missed tackles last year, the 6-foot-even, 205-pound Gant could be the “missing piece” that New Orleans needs in their defensive backfield for the upcoming 2019 NFL Season and beyond. The Saints would merely be seeking a player with good value by this point near the end of the Draft on Day 3, and they find it with underrated South Dakota State University CB Jordan Brown. The 6-foot-1, 200-pound Brown was chosen as a small-school 1st Team All-American and a two-time All-Missouri Valley Football Conference 1st Team player last season and is generally regarded as one of the top NFL Draft prospects at the FCS level. Originally a wide receiver in high school, Brown switched over the opposite side of the ball once he arrived at South Dakota State; where in his 51 career games played at the school, he totaled 148 tackles, 6 TFL’s, four forced fumbles, 35 PBU’s, and eight interceptions. With P.J. Williams possibly seeking to leave the Black and Gold via Free Agency next month, the addition of Brown would give the Saints added depth as well as a bit of reassurance should Williams decide to leave NOLA. The Saints have another pick at the end of Round 7, which they received from the League as compensation for losing back-up defensive tackle Devaroe Lawrence just before the final roster cut-down at the end of the last preseason. However, until the NFL office determines what order to place those compensatory picks in, New Orleans only knows for now that they’ll be picking towards the end of the round. The Black and Gold ideally would like to find a player with enough potential to make their Final 53-man roster with this pick; likely do so with the selection of University of Ohio offensive guard/tackle Joe Lowery. Pro Football Focus notes that the 6-foot-6, 310-pound Lowery was a 2nd team AP All-American last season at left tackle for the Bobcats; allowing just nine QB pressures all season long in pass protection. They add that Lowery’s 85.3 run-blocking grade was incredibly 7.2 points higher than the next closest tackle. Lowery’s ability to play either side of the line either at guard or tackle should intrigue teams that could use his notable versatility, and should the Saints, and starting left guard Andrus Peat not be able to work out a new deal next month, Lowery could end up being the player that replaces him. Is 2019 Brees’ last chance?